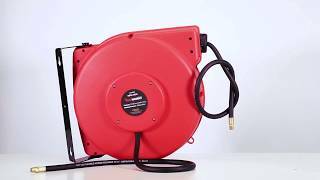 The ReelWorks L715153A plastic retractable air compressor/water hose reel is constructed using high-quality impact resistant polypropylene. The latching mechanism will automatically lock the hose at your desired length; while the attached swivel bracket can be mounted on a wall or ceiling; allowing 180-degree rotation. The hybrid polymer hose has no memory to helps eliminate kinks. One 36-inches lead-in hose is included. One 36-inches lead-in hose is included.